Many people are attracted to Stoicism because it seems to offer something more profound than the usual self-help palliatives. Stoicism proposes philosophy as a foundation for wise living. One aim of the Stoicism Today project has always been to increase awareness of Stoic ideas and practices. The Stoicism Today team has written booklets, recorded guided meditations, started Facebook groups and given workshops at annual conferences to help spread Stoicism. At the same time it has aimed not merely to disseminate information about Stoicism but also to test Stoicism out and develop it into a modern Stoicism. To this end the Stoicism Today team has designed and administered questionnaires, emphasised some elements of Stoicism more than others and incorporated a number of ideas from contemporary psychology. Marcus Aurelius (Meditations, 6.21) alludes to one way to achieve personal and philosophical growth, namely to treat criticism as useful feedback. In this article I want to tackle two criticisms of Stoicism. By addressing them I hope to work towards making Modern Stoicism even more wise and helpful. Two comments about Stoicism have given me particular cause for reflection. One came from participants at the London Stoic Conference of 2014. They pointed out that whilst many speakers had talked the importance of virtue, they hadn’t fully explained what virtue was or how we could become more virtuous. My Stoicism Today colleague Christopher Gill has since responded to the question What is Stoic virtue?. [i] He points out that the cardinal virtues are not plucked out of thin air. The Stoic cardinal virtues then are key qualities required to flourish as a human being. Here I will look at the second part of the question – how to become more virtuous. To be sure there is already much in Stoicism and the Stoic Week handbook about developing virtue. This is not the place to rehearse the plentiful advice contained in the handbook. On careful examination, though, it could be argued that much of this (for example counsel such as “control the controllables” and “only virtue really matters”) relates more to to Stoic wisdom than the other specific virtues. One approach would be to collect all the Stoic maxims we can find about specific virtues – and this would actually be a very useful thing to do – the question is – what else can we do? How to best build justice, self-control, courage, wisdom and other virtues is essentially an empirical question. One of the key take-home points from contemporary psychology is this:- Whilst some plausible methods turn out to work well, other, equally plausible ideas do not. [ii] Thinking about how to develop virtue in our armchairs will only get us so far. A promising idea is to look at modern evidence-based psychologies to see if they can tell us anything about how to develop virtue. Two obvious candidates are Cognitive Behavioural Therapy (CBT) and Mindfulness. Perhaps they could help us be more virtuous. Although the focus of CBT is traditionally on reducing emotional distress rather than building virtue, CBT has a huge evidence base and should not be dismissed too lightly. We can certainly use CBT to help us develop the habit of thinking more realistically and constructively, which is definitely part of wisdom. Furthermore CBT practitioners have developed a large toolkit of techniques that can be adapted to build individual virtues. Behavioural experiments, guided discovery, exposure to feared situations, thought records and formulation – to name but a few CBT tools – could all be adapted to help develop virtue. [iii] For example, to build courage you could challenge unhelpful negative thinking (“great harm will come to me if I tell the truth”) and develop behavioural experiments – for example “plan to do one act of courage today, record your predictions as to negative and most likely outcomes, note what happens and decide what you can learn from the experiment”. To build self-control you could learn to challenge thinking biases that contribute towards a lack of self-control. For example, you could challenge the short-term bias of the thought “What I gain in the short-term is more important than what I lose in the long-term”. CBT could also help you environments more conducive to virtue. For example “In order to go out for a run every day I will put my running clothes next to my bed so I put them on when I get up.” Donald Robertson’s Stoic self-monitoring record sheet is an excellent example of how drawing on CBT has already helped modern Stoicism teach us how to build the virtue of wisdom – see also my Stoic worry tree. A second candidate is Mindfulness. Mindfulness has become part of the Zeitgeist, there is proven benefits that it can help [iv], and there is a good argument for incorporating mindfulness into Stoic Practice. [v] Learning mindfulness – the capacity to take a step back and respond rather than react – could certainly be a useful part of virtue training. However, there is reason to doubt whether learning mindfulness is there is to learning to be virtuous. One problem is that mindfulness without the rest of virtue mindfulness could actually do harm. As Mathieu Ricard – a veteran of thousands of hours of mindfulness and a well-known exponent of mindfulness – points out – “a sniper waiting for his victim: … To succeed in his ominous goal, he has to ward off distraction and laxity, the two major obstacles to attention. The practice of mindfulness thus needs to be guided by right view and insight …and motivated by the right intention”. In other words, mindfulness needs to be guided by virtue and wisdom –otherwise it can be used in the service of morally indifferent of even evil ends – such as becoming a more skilled sniper. So far we have found two evidence-based psychologies that can help us provide tools to develop virtue – CBT and mindfulness. We can and should incorporate these ideas into our approach – but it would be even better if we could find an evidence-based approach already uses these ideas and is more focussed on building virtue rather than part of virtue. We will return to this quest, after considering the second criticism of Stoicism that has given me much food for thought. This objection will already be familiar to many readers. Some critics say that Stoicism comes across as a cold, unemotional philosophy, perhaps thinking of Star Trek’s Mr Spock. Unfortunately, this impression isn’t restricted to those who are ignorant of Stoicism. No less a philosopher than Martha Nussbaum has gone on record as saying that ”Stoicism is an anti-compassion tradition“. Of course, Nussbaum’s view is highly contentious. Unlike Epicureanism, its ancient rival, Stoicism has always had a strong political dimension. Hierocles’s concentric circles provides ample illustration of Stoicism’s benevolent concern for the whole of mankind. Perhaps the issue isn’t so much about Stoicism not really being compassionate, but about how Stoicism presents itself. Maybe Stoicism needs to put its most compassionate foot forwards. It could very reasonably be argued that Marcus knew this was the best way of giving himself a good pep talk, and that he wasn’t suggesting that everyone else would be motivated by the same language. Marcus was, as far as we know, writing his Meditations purely for himself. However unlike Marcus, we are writing for a broader audience, including those who already have a tendency to be too self-critical. So perhaps we need to be mindful of the dangers of using compassionate language which isn’t compassionate. So far we have looked at two apparently separate topics. First, how to help people become more virtuous. Second, how Stoicism might benefit from presenting itself in a more compassionate and self-compassionate manner. It would be very good news indeed if there was an evidence-based therapy that addresses both of these concerns. It’s entirely possible that there is such a therapy, and it’s name is Compassion Focussed Therapy (CFT) and its related set of practices Compassionate Mind Training(CMT). [vi] CFT is an integrative, evidence-based, third-wave CBT therapy developed largely in the UK by psychologist Paul Gilbert and colleagues. CFT draws on ideas from CBT and mindfulness as well as neuroscience (e.g. Porges’s polyvagal theory. ), developmental psychology (e.g. attachment theory) and philosophy, especially Buddhist ideas relating to compassion. Each state has typical emotions, motivations and neurochemistry. The ultimate aim of CFT/CMT is to develop a compassionate self which is strong enough to achieve optimal emotional balance between these three emotional systems. “a sensitivity to the suffering of self and others, with a deep commitment to try to relieve it”. To do this, you need much more than just sentimental warmth and kindness. If you ask people for examples of compassionate people, they will give you names like the Dalai Lama, Nelson Mandela, Martin Luther King, Jesus, Mother Teresa, Florence Nightingale and Gandhi. These people may be are warm and kind, but they are also courageous, strong, wise and responsible. When CFT/CMT tries to build compassion, it also tries to build these other qualities. It was when reading this that I had one of those “Aha” moments. Virtue in ancient philosophy means justice, courage, wisdom and self-control. Compassion in CFT/CMT is sounding a lot like like virtue in Stoicism and ancient philosophy. If CFT/CMT provides an evidence-based route to building “compassion”, could this help us with building virtue? 2) The second stage of CFT/CMT is psychoeducation about the brain, including the new brain and old brain, the amygdala and the three emotional regulations systems. An important message here is that we all have “tricky brains” and many of us have difficult pasts. The behaviours that cause you problems are not your fault. However learning to deal skilfully with your reactions and tricky brain is your responsibility. Note that CFT/CMT uses truly compassionate language – combining warmth and non-judgement with the need for courage and responsibility. Safe Place Guided Meditation. Imagining a safe, welcoming place to help get the soothing and affiliative system on line. Ideal Compassionate Self Guided Meditation. Having got the soothing system on line first with soothing breathing, imagining yourself having the qualities of compassion –kindness, confidence, maturity, strength and authority, wisdom and insight– and imagining acting in a compassionate way. Ideal Compassionate Other Guided Meditation. Imagining compassion flowing to you from another ideally compassionate being, imagining what advice they would give you – to help you build up the feeling of what it is like to feel compassion. Compassionate Letter Writing, Using expressive writing to understand your problems compassionately and planning how to deal with them more skilfully. Behavioural experiments Testing out more helpful strategies that cultivate compassion and self-compassion. Can CFT/CMT help Modern Stoicism? We are now in a position to explore whether CFT/CMT can help. Modern Stoicism and CFT/CFT have many similarities but there are also important differences. I believe that there is the potential for a powerful synergy between Stoicism and CFT/CMT. To conclude, here are five practical ideas which address the two concerns raised and could help Modern Stoicism be wiser and more helpful. All of these are often used in CFT/CMT and would l I believe would sit well in Stoic Training. 3) Use CFT-informed Compassionate Self meditations as rehearsals for the day ahead and for challenges you face in general. These are eyes closed exercise, starting with soothing breathing. Like an actor, you imagine yourself with all the elements of virtue – wisdom, courage, persistence, justice, compassion, self-control, moderation. You imagine yourself behaving in a virtuous way, even when difficulties arises. This is obviously similar to the morning meditation and negative visualisation – the value added is in incorporating ways to bring the soothing and affiliative system on-line and to rehearse using specific virtues. The Idea is to blend Stoic ideas about wisdom and other specific virtues using compassionate language and evidence-based methods like soothing breathing, mindfulness and compassionate self meditations. Over Stoic week 2015 I wrote a script for several of these, on self-control, the serenity prayer (Stoic Wisdom) and Stoic compassion . Here I will give the full script and a recording on persistence, an important quality modern psychologists call “grit”. Epictetus would say that there were two vices much blacker and more serious than the rest: lack of persistence and lack of self-control. Lack of persistence stops us from enduring hardships that we need to tolerate, lack of self-control stops us from resisting pleasures or other things we ought to resist. Anyone who says that philosophers are too obscure or complicated should be made to read that quote. Stoicism couldn’t be simpler. We must commit the words “Persist and Resist” to memory and keep saying them to ourselves. Move over mindfulness, recite the “persist and resist” mantra instead. As well as negative thoughts, people often give up because of a setback or an obstacle . Here the Stoic advice to think of what the sage would do in this situation is valuable. When it comes to dealing with setbacks, I really admire the attitudes of Winston Churchill and Thomas Edison. The Stoics give us one more relevant piece of wisdom in the analogy of the archer. An archer should take accurate aim, and then accept fate if the arrow gets blown off course. In the same way we should focus on what is under our control and not get discouraged if fate prevents success. We should control the controllables. So the Stoics give us four excellent pieces of advice when it comes to persisting and developing grit. We can use the mantra “persist”, we can challenge the validity of discouraging thoughts, we can reframe failure in the same way as the sages on success and failure do, and we can focus on what we can control and leave the rest to fate. Let’s spend a few moments using a visualisation informed by Stoicism and Compassionate Mind Training to help us build up the virtue of persistence. So think of something you want to achieve – it could be developing Stoicism into daily rituals, or changing career, or getting fitter – or something else that is important to you. If you are comfortable doing so, now close your eyes and prepare for this modern Stoic meditation. First to help your mind be in a calm state, let’s try a few moments slow soothing compassionate breathing. Imagine trying to achieve this and then something getting in the way. Now in your mind’s eye imagine saying to yourself “Persist, Persist”. Next imagine a negative thought getting in the way – perhaps “I’ll try again next year when circumstances are better”. Remind yourself that this thought is just an opinion, it’s not an objective fact. Reflect, like Thomas Edison did, on what you can learn from this setback. Perhaps you’ve learnt another way not to do it! Next think of something you can do that is under your control to take you in the right direction. Imagine doing it, whilst repeating to yourself–persist, persist, persist. Then imagining yourself persisting until you succeed. Finally imagine feeling satisfied for having persisted, despite the temptation to give up, putting into practice the virtue of persistence. To conclude, in this article I have taken Marcus Aurelius’s advice to learn from criticisms of Stoicism to heart and explored how CFT/CMT can help develop modern Stoicism into a more compassionate practice that can develop specific virtues. We can now see that Marcus’s advice is itself an example of true self-compassion, meaning not sentimental warmth but a wise, responsible, courageous commitment to improving the well-being of oneself and others. Tim LeBon is a BABCP accredited CBT therapist and UKCP registered existential therapist, an APPA and SPP registered philosophical counsellor and is also trained as a life coach and integrative counsellor.He is a past Chair of the Society for Philosophy in Practice (SPP) and the founding editor of Practical Philosophy. He is the author of Wise Therapy (Sage, 2001) and Achieve Your Potential with Positive Psychology (Hodder, 2014) . You can read more about Tim’s work on his blog, Socrates Satisfied, and his website. [ii] See LeBon, T. Achieve Your Potential with Positive Psychology pp xi-xvi (Hodder Teach Yourself Series, 2014) for some examples of how some very plausible ideas about personal development don’t actually work so well in practice. [iii] See LeBon, T. (2014) chapter 9 for more on the CBT toolbox. [iv] See LeBon, T. (2014) chapter 10 for more on mindfulness. [v] Though as Patrick Ussher has argued, Stoic mindfulness (prosoche) has a bigger part of Stoic virtue, and is a bit different from mindfulness. [vi] CFT was originally developed to help people who have particularly high degrees of shame and self-criticism, who often didn’t respond particularly well to standard CBT. Of particular interest to us though is that is how CFT is now being extended to include broader populations. The training that is aimed at the general population as well as a clinical one is called Compassionate Mind Training (CMT) and it is this part of CFT that is particularly relevant to us here. For the rest of this article I will refer to this approach as CFT/CMT, because our focus is more on helping the general population than on psychotherapy. [ix] See http://blogs.exeter.ac.uk/stoicismtoday/2015/06/14/how-to-become-more-virtuous-and-less-like-basil-fawlty-tim-lebon/ for my 2014 workshop which was aimed at developing an Ideal Stoic Advisor. Surely that should be “he did a much better job of leveraging _pity_” shouldn’t it? Forgive me but I can’t stop laughing! I no longer have any uncertainty about which of you it is who is unteachable. On a more constructive note—thank you for what was actually a remarkable efficient conversation about tone. We very quickly isolated the basic differences that we have in our opinion about mockery—I think you used my Epictetus quote on Socrates and my Pascal quote very effectively to demarcate your own views on rhetoric; and with your remarks on “political correctness” you began to get at the reasons why you think an aversion to mockery can itself do damage. These are very contentious and complex philosophical topics to discuss. For a volley in what some have called the “tone wars,” I think it was quite an effective conversation. Solid stuff, Sigmax. Myself, I was hoping you might adopt Archie’s admiration for ad hominem “argumentation” and start slinging epithets; there were a couple of good ones on my wish list. But your way was much better. Hah. Thanks for the vote of confidence from the gallery ;). If one is going to take up a stance *against* mockery, though, I have to at least try and practice what I preach! I quite like Nigel; he amuses me. And I have not made any “vicious accusations about his character”. I find his shallowness very endearing. Any ideas to the contrary exist in your imagination not in fact. My goodness me, I find it surprising you can be so poe-faced about this. Lighten up, friend. No your misreading of the situation has led you to grasp the wrong end of the stick. Well, take sides, why don’t you! I give up, yes that easily! If you’re really more interested in hearing Nigel’s strange opinions, than in reading and studying the Stoics themselves, don’t let me stop you. That’ll teach you to intervene between husband and wife! This string of thinly-veiled invectives is useless to me, as a third party. It is poor rhetoric. You might as well slap him in the face—it has the same logical effect. “Now, this was the first and chief peculiarity of Socrates, never to be irritated in argument, never to utter anything abusive, anything insulting, but to bear with abusive persons and to put an end to the quarrel.” —Discourses, II.12. I’d love to hear the other side of the story, but so far you haven’t told me anything about what is actually wrong with Nigel’s remarks—besides that little quibble of “Epictian.” I thought it was cute, but apparently it offended you. Are you aware of the fact that he used a great deal of irony in his conversation? Are you aware of the fact that he loved to mock, to ridicule, and to tease his interlocutors? Why do you think so many Athenians voted against him at his trial? You bang on about my ‘rhetoric’ but I have made no Thrasymachean speeches, I keep things short and to the point. I’m no sophist; I don’t have time for rhetorical flourishes. However, if you enjoy Stoic rhetoric, Stoic layman’s rhetoric that is, not Epictetean, I suggest you join the stoics Yahoo group where you can witness Nigel at his interminable quibbling best. As for Epictetus’s view of Socrates, like his view of Diogenes, it is idealistic, idolatrous, and way too rhetorical for me. Indeed, he did. Epictetus was using him as a vehicle to express an ideal. The Socrates I know from Plato could indeed be very sassy and patronizing! In a kind of nerdy way, I’m delighted at your response to Epicetetus’s use of Socrates—I’m impressed at closely it mirror the way that Christians debate proper dialogue, and try and use the figure of Christ to censure or or justify, respectively, derision as a valid rhetorical tool. I think you misunderstood my use of the term. I was not suing rhetoric in the derisive sense, as in “empty rhetoric” or “sophistry.” I mean simply the effort at persuasion. My point was that your attempts to deride Nigel do nothing to persuade me that his arguments are incorrect. Instead, they backfire, and severely undermine your ethos. Apologies if I have taken the conversation in a non-constructive direction. Rhetorical tone is a very difficult thing to debate. You and I clearly have very different precognitions, if you will, about what ideal, virtue-based dialogue ought to look like. Apparently, Stoics are as divided on this question as other communities are (such as Christians, or atheists—lord knows atheists have had enough arguments in recent years over appropriate tone!). But otherwise may I thank you for your refusal to follow Archie’s line without evidence. I am sure that there is a small kernel of truth in what he has to say. After all, if I was not enjoying the debate and getting something out of it I would not participate. However, while acknowledging that I would naturally be blind to any failings on my part of which I have no knowledge, having had Archie bring such to my attention so often I am pretty sure that my failings are not nearly as bad as he makes out – other than maybe my verbosity. On this I can only apologise. I had a developmental issue and did not speak till I was 5 and, as others have commented, I have been making up for it ever since. In my defence, when it comes to Stoicism, many of the issues being discussed cannot be effectively summed up in maxims and in fact need a far more detailed explanation when trying to outline one’s view. I will leave you to judge as to if “there is very little substance to anything he might say”. While Archie offers good advice for the beginner regards what books to read in addition to Epictetus, my impression is that you are not such a novice. I am sure that you are aware of the Stoic metaphysics and the like and how such may add depth and nuances to what Epictetus is reported as saying. I of course would be happy to *defend* or expand on anything I have posted here or elsewhere – and even if necessary to withdraw any comments shown to be inaccurate. I wish you well in your investigation of Stoicism. Or was he simply giving vent to his own emotional, passionately held, idealism? In any event he was expressing a commonly held idealistic view of Socrates, one that has permeated its way even down to modern times. Additionally, Epictetus’s own philosophy master, Rufus, was known as “the Roman Socrates.” And Epictetus himself was Arrian’s very own “Socrates”. He, Arrian, that is, was known as “the young Xenophon” because the relationship between himself and Epictetus parallels that of the relationship between Xenophon and Socrates, that is, the _actual_ Socrates. Confused? I hope not. There are parallels between the two pairs. It has even been suggested that Socrates began life as a slave. Of course, Epictetus was, before he set up his school in Nicopolis, a slave in Nero’s court / household. Arrian, Epictetus’s young pupil was a member of the provincial Roman aristocracy. Their social origins / positions were very different. And there can be little doubt that Arrian had difficulty in following Epictetus’s speech, specifically his pronunciation, which has led to at least one major fundamental doctrinal error. Yet now we are told we commit a logical fallacy if we _ad hominem_ someone! Schopenhauer regarded attacking the man as part of the whole apparatus of debate. And I agree with him. It seems to me we are becoming more and more politically correct; introducing more and more taboo areas; and, all in all, stifling free speech (parrhesia). It is remarkable that the ancients seem to have had more freedom in this respect than us! In your eyes, maybe, but what difference does that make to me? I mean, do you really think I give two hoots about what anybody thinks of me who doesn’t actually know me? Agreed on all points re. Socrates in Aristophanes, etc. Well, I certainly hope you don’t care much about what an arbitrary Internet stranger thinks about you as a person. But that misses the point. Strictly in the context of this conversation, presumably you wrote comments here because you had some kind of a point to make, either to Nigel or to some other audience. Your tools, then, are logos, ethos and pathos—the same as in any other presentation. I am just one audience member—one noisy datapoint, that you are free to dismiss as an outlier if you don’t trust my judgment. All I can say is that Nigel completely swept the floor with you as an interlocutor, from my perspective. Not because I think his logical arguments were somehow perfect, but because he did a much better job of leveraging ethos. I agree with you that not *all* ad hominem is illegitimate. Sometimes information about a person is important to forming a correct judgment on an issue. Furthermore, it is true that, however strongly I may personally feel that mockery and derision are illegitimate tools—it is absolutely possible to leverage them as effective and powerful rhetorical techniques, from a utilitarian vantage. Pascal, Voltaire, and Christopher Hitchens are cases-in-point. I would never deny that they were extremely effective at getting their points across, whatever qualms I might have about their methods. So, if I cannot convince you that mockery is fundamentally inappropriate from a virtue-ethics stance, then I would at least try and point out that there are effective and ineffective ways of using it. You’re classy guy. Keep it that way :). Each day we suffer. Sometimes in big ways, most of the time is small. We don’t think of ourselves as suffering, we think this is a normal part of our life. These continual small amounts of suffering affects our happiness. They also affect the happiness of those around us, and how we feel and act. I believe the cure is self-compassion. Self-compassion eases the pain of the suffering. It reduces the bad effects and allowing us to choose more helpful ways of living. I realise this sounds intangible and vague. If you become mindful towards this suffering you’ll begin to notice it. Then accept it, don’t ignore or avoid it. Accept that it’s a part of life. Then let go of what’s causing the suffering. Release it, or put it to one side. The cause is likely something you wish were different. Instead, appreciate things as they are. Be grateful for the reality that’s happening right now. I have two issues with which I’d like some help . . . Stoicism contains a number of paradoxes, and even outright contradictions, that, in my view, are never satisfactorily resolved. Some are acknowledged (and are the subject of discussion and analysis, such as the coexistence of free will and determinism), and some are not. The most crucial paradoxical issue in the latter category concerns what human nature consists in. So reason (or making right/appropriate decisions) is the capacity of selecting that which is “morally good”—i.e., the virtues—which consists of such things as justice, courage, prudence, temperance, and kindness. (Arguments as to why these traits, as opposed to others, are the virtues constitute a separate issue.) Arguably, all the various virtues may be subsumed, a là Zeno of Citium, under the heading of “wisdom.” In such a view, all the separately named virtues are simply manifestations, or applications, of wisdom (right choice, appropriate acts) under different circumstances (bravery, for example, is wisdom in the face of peril; and justice wisdom in the face of distribution of valuable commodities or in how we treat other people, moderation wisdom in what and how we acquire things). The problem, as the Stoics see it, is that everywhere most if not all people mistake the externals for what is important and make decisions about how to live based on this mistake. They focus on such distractions as achieving worldly success, gaining wealth, being liked by others. That is, everywhere one looks one observes people not being virtuous—not living according to reason, not living according to nature. Since the Stoic wise person (or “sage”), the person who always makes the right selection and is therefore virtuous, is exceedingly rare—if one ever existed, that is—all people are basically “fools” or “mad” and leading lives of vice as opposed to virtue. Yet Stoics maintain that living according to nature consists of NOT manifesting this particular behavior, but instead consists of living according to reason, which rejects this “natural” behavior, which is nevertheless ubiquitous in humankind. In other words, Stoics say that what is “natural” is to act AGAINST nature, and acting against nature is acting according to nature. How might Stoicism address this paradox? I have a second question to which, so far, I’ve been unable to obtain a satisfactory answer, though I’ve corresponded with leading scholars in relevant fields (Stoicism, ancient history, etc.). Perhaps you can help, if you’re willing. How does one reconcile the compassionate Stoic philosopher who authored the Meditations with the emperor who conducted bloody warfare against Rome’s Germanic enemies and who allowed “persecution” of Christians? What I really want to know is how Marcus himself dealt with this apparent dilemma, but I’ve had no success learning anything helpful from the literature; so I’ve had to settle for how his biographers handle the matter, when they deal with it at all. I’ve read all the available biographies of Marcus, but nowhere do I find a description FROM MARCUS of how he directed such violence and caused such suffering while espousing Stoic principles. Given what I take to be his sincerity and honest self-criticism in the MEDITATIONS, in combination with his lifelong interest in a basically benign philosophy and his obvious intelligence, I think it unlikely that Marcus did not measure his actions during war and the treatment of dissident political/religious groups against the principles of Stoicism. That he didn’t even mention the matter in his personal writings, therefore, leads me to suspect not that he didn’t consider the apparent conflict but that he failed to resolve it. Can you point me to any references that (a) offer analyses or interpretations of this matter from a third party or (b) provide insight into how Marcus himself dealt with it? I’d be grateful for any assistance or suggestions. Marcus’s public political legal and military duties were foisted on him due to his high social position whereas his private philosophically somewhat escapist thoughts and meditations are just that, they were never intended for public perusal, certainly not in his lifetime, but we can surely say that they more truly represent the inner man. The disconnect between public and private is nothing particularly remarkable. As for the contrast between the vice-ridden way most people will live if left to their own uninstructed devices, with all its attendant ills, and the virtuous path of the philosophers, I can see no paradox. We must take into account the fact that the word ‘natural’ is highly ambiguous. The philosophers simply said that if men lived a good and excellent life, as far as such is possible, and they even gave guidance on how this might best be done, things would go better for them. I think you’ve made a lovely summary of Stoic ethical theory (though I’m not sure what it has to do with this particular post). Re. “paradox” #1, Epictetus actually explicitly acknowledges the disconnect between “natural” impulses and living “according to nature” in Discourses, Book I.11. He points out that a tumor is “natural”—but we do not call it good—and then he asks how we can discriminate between good and bad. So I think it would be better to categorize this as an “acknowledged” paradox. I’m an amateur, not a scholar, but I think it’s fairly clear (if not from that chapter, then from the Discourses in general) that Epictetus, at least, resolves this problem via his understanding of the divine. For him, living in accord with nature is synonymous with living in accord with the will of God. “Where the nature of God is, there also the nature of the good should be” (Book II.8). I see at least two different ways that he describes following God. Second, the famous conversation with Zeus at the beginning of the Discourses claims that Zeus wanted to endow us with complete, untarnished reason, but that for some reason He could only give us a tiny spark of the full reasoning ability that the gods enjoy. To Epictetus then, reason is both the purpose that we were created for BY nature (Zeus), and the defining quality of the gods, who nature intends us to imitate. “If the divine is faithful, man also must be faithful; if it is free, man must also be free; if it is beneficent, man also must be beneficent; if magnanimous, man also must be magnanimous; as being then an imitator of God, he must do and say everything consistently with this fact” (Book II.14). I agree. For Epictetus following Zeus (“Lead thou me on O Zeus and Destiny”) is what it’s all about. One of the problems you are encountering is that so much that is written and said on the subject that appears to be paradoxical comes from Epictians [Epict-ians] who limit many of their views to only what the ‘master’ says. 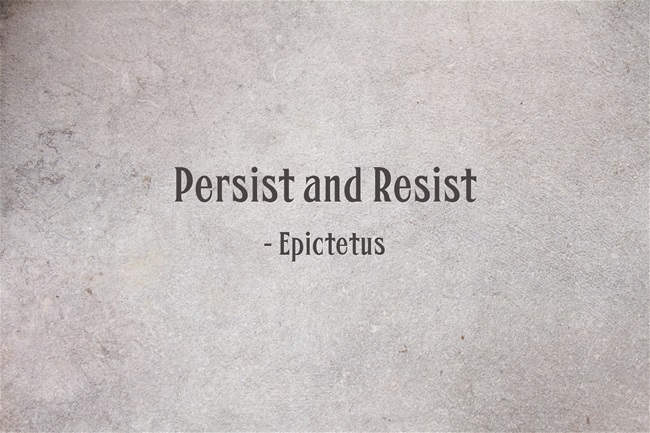 For instance what Epictetus was offering at his school was a form of therapeutic education and was aimed at providing a version of the Stoic mind training. What we have of his views relates to only the mind and has less to do with the practical application of the mind training when it comes to actually living the Stoic life. Much is made of our responsibility to make correct judgements, judgements over which we have total control. What is omitted is our responsibility to make judgements and decisions and to try to apply such to our lives – even in situations where we may not have total control. Actually, despite many claims to the contrary, Stoicism as a whole does not reject the natural behaviours – Stoicism trains us to make correct judgements etcetera whereby we try to ensure that the behaviours serve us as they are meant to do. One needs to see Marcus in the context of his times. Would any of us have acted differently to him if we had been immersed in the culture that he was brought up in? However there are some aspects of modern society that show that he was trying his best. Just look at Obama wanting to change American gun laws and how he cannot do so because he cannot overrule the Senate and Congress. Marcus was in the same boat. The Roman Senate passed the laws regards the Christians. Marcus could not change matters – but it is reported that he discouraged the various Roman governors from looking for Christians on the basis that if they did not look they would not have to apply the laws of the Senate. Marcus is only reported as going after Christians when a particular Christian sect tried to encourage the overthrow of his governance while he was away trying to defend the Roman Empire. As it is Marcus is not known as one of the ‘good Emperors’ for nothing. He did at least try. If you want to go into greater details on this and other matter I would be happy for the Stoicism Today team to let you have my email address if you want to contact them for it. We could then start a more detailed discussion if you would like to. Actually, we admirers of the Epictet(e)an philosophy are called ‘Stoics’ ‘Cynics’ ‘Philosophers’ and ‘Christians’ BUT NOT ‘Epictians’ – where on earth did you dig that one up from? If you actually took the trouble some time to read and digest Arrian’s Diatribes of Epictetus, (I say that because from the way you speak it appears you haven’t done anything more than turn the pages of Arrian’s Manual,) you too might begin to see him as an eminent teacher / master and a pretty impressive human being. Perhaps they didn’t have school masters where you come from, so you are not familiar with the term, I don’t know, but your unbridled attack on Epictetus and his admirers and followers – ancient and modern – verges almost on the defamatory. You would do well button your loose tongue and control your passion for prolixity, and, furthermore, open your mind, for you might then learn something from one of the best teachers that ever lived. Your attempts at trying to make those who follow Epictetus look ridiculous by your apparent claim to be one of them and your over the top ‘feigned objections’ to what I have said are not helpful to the discussion. I admit that I use Epictetus a little bit like that—but only because he is the closest thing we have to a comprehensive, systematic presentation of Stoicism, so it’s easy to use him as a reference for “proof texts.” I mean, he left us the biggest, arguably most substantive book on Stoicism to survive—of course he’s going to be a major figure in how we define Stoic views. So, not to prolong this comment thread, but I’m curious, Nigel—are you suggesting that a “practical application” of Stoicism needs to focus more on something like Irvine “trichotomy of control?” The idea of doing our best in situations where we only have partial control does appear in Epictetus, as far as I know it is not emphasized. Or are you saying that a practical philosophy needs more specific content to help us learn what correct judgments *are,* in contrast to Epictetus, who spoke an awful lot about correct judgment but preferred to speak on the level of abstract principles rather than specific examples? First off, I apologise for my error in stating “his views relates to only the mind” when I meant to say “his views relate mostly to the mind”. As to what I am saying, I am trying to say that what we have from Epictetus is not of its own “the closest thing we have to a comprehensive, systematic presentation of Stoicism.” It is more a systematic presentation of the Stoic mind training. There is so much more to Stoicism than what many modern scholars present as being Epictetus’ Stoicism. So, in trying to answer your questions, let me say that I am not anti Epictetus. Epictetus had an obvious belief in the wider teachings of Stoicism – wider than the syllabus that we have a record of him teaching. He clearly alludes to, if not out rightly talks of many aspects of Stoicism other than just the mind training that was the subject of what he taught. Yet many today want to only follow certain aspects of the syllabus as reported by Arrian – that is treating Stoicism as a therapy, a sort of CBT plus. Whereas Epictetus had a definite spiritual view that includes a belief in God and his ideas were clearly based on the Stoic metaphysics – all of which is often omitted in so called modern Stoicism. Further, as we have only a limited record of what Epictetus taught as a whole, in order to fill out the full nature of what we know of what Epictetus was teaching, we also need to go back to the teachings he studied – at least as best we can. As to Irvine, the answer is *possibly* yes – but don’t hold me to that. Even if we only have partial control over various ‘externals’, including our bodies, it is clear that we need to take responsibility for what control we do have. I am sure that if I were inclined to look I would be able to find quotes from Epictetus and other Stoics of old that uphold this. But from memory, whereas many claim that Epictetus saw love as a pathos that was to be avoided at all cost, Epictetus does talk about ensuring that one’s love for one’s spouse and children is appropriate. Such love involves externals and natural forces both of which we do not have total control over, yet Epictetus expects us to give our love the same attention as we would give to those things over which we do have total control. Again, I apologise for my words, but I do not deride Epictetus, neither do I see him as a ‘master’. Stoicism is meant to be based on reasoned understandings – not on the words of some single personality. All too often, because of setting Epictetus up on a pedestal, many claim that what Epictetus taught *is* Stoicism and quotes from other Stoics are derided because they offer an apparently different perspective than that which some moderns have tried to interpret as being ‘Epictetus’ philosophy’ as against what is ‘Stoic philosophy’. As someone who only really started learning about Stoicism in the last six months, it is clear to me that I will still have much to learn after I finish reading Epictetus :). For all our sakes please don’t encourage Nigel. I’m sorry to have to say this but the man is an inveterate and hopelessly incorrigible babbler / waffler but, worse, there is very little substance to anything he might say about the Stoics. Of course, Nigel loves nothing better than hearing himself talking about his weird take on the Stoics but, unfortunately for the rest of us, this self-indulgent waffle of his soon becomes very tedious. Grant him a column inch and it’s guaranteed he’ll overrun it by several yards. There are no doubt many reasons for his lack of control. My guess is he uses this tactic in the hope of wearing down all opposition to his bizarre brand of Stoic philosophy. My advice to you Sigmax is this: pay very little heed to anything Nigel says about the Stoics. Definitely continue reading Epictetus: he is the nearest thing we have to the authentic ancient Stoic article. And read also Marcus Aurelius. Oh, and while you’re at it check out Seneca’s belles-lettres to Lucilius. You might also read Diogenes Laertius book 7. These four works will give you the essential grounding you need to pursue further studies if that is your desire (but be warned, Stoicism can become an addiction!) There are other works but these four are the primary texts which will stand you in the best stead. Everything you say could be true. But your anti-Nigel rhetoric gives me almost no information to go on. All I have to go on is the context of this one comment thread. It seems that I have stepped into the middle of a long-going argument that cannot be understood without considering a huge amount of previous baggage. It’s as if you are a married couple hashing out a tired, recurring argument, and I am a mere passer-by. All I can tell from this thread is that Archibald has an extreme dislike for Nigel, and won’t hesitate to make vicious accusations about his character. Archibald’s censure of him tells me more about Archibald than it does about Nigel. All I can tell from this thread is that Nigel has said little to nothing about Archibald’s character, and has merely shared a few opinions about what various Stoics believed. Perhaps those opinions are very controversial. I wouldn’t know. As a stranger to both of you, merely passing through, it is impossible for me to discern from my position which one of you it is who has the specious and unteachable opinions. You know best what you’re doing but, nevertheless, the offer stands if at any time. . .
By far one of the most useful Stoicism posts I’ve read! This is exactly what I’m looking for out of modern Stoicism: deep reflections and solid, practical exercises for building virtues, plus a strong focus on compassion. It took me a couple of decades to understand why my Theology lecturer told us that we should recognise that the parable of the good Samaritan is as much about accepting help as it is about giving it. Thank you Tim for this, and as always the Stoicism Today continues to help the general population by reaching out even further and widening the Stoic net. In my opinion CBT combined with it’s maker, ancient Stoicism, never quite formed an holistic therapy to heal the entire person. There seemed to be something missing. But with the addition of the CFT/CMT dimension it really adds up to form modern Stoicism – truly brilliant. Great article! I’m impressed by the pointed out relations between stoicism, attentiveness and modern psychology. 1. What do you think of the research of Mischel and Duckworth being used by Modern Stoics in the development of spiritual exercises for self-control? 2. How alarmed do you think Modern Stoics seeking to do the above, should be about the non-replication controversy in psychology/behavorial/social sciences? Regarding question 1 – clearly I am in favour of Stoics incorporating validated research findings, indeed that’s something I’m working on, especially if they are in the spirit of Stoic ideas. Regarding 2 – not sure, what do you think? I would say that we should treat all research results with some caution – obviously the better the evidence (as with for example the CBT for panic disorder) the more seriously we should take it. It’s interesting as a cautionary tale for me. I haven’t incorporated ‘power poses’ into my daily practice. Likely not too now. But I am very excited to see what things that are validated being incorporated into spiritual exercises, hence the excitement with your piece. I hope they release video of your presentation from last year’s STOICON and look forward to watching your presentation at this year’s STOICON when it is put up online. This is a par excellence article! Tim, are you familiar with the practice of naikan from Shin Buddhism? In naikan a person reflects on three questions: What have I received from others? What did I give to others? How did I cause trouble or difficulties for others? Asking these questions reminds a person of how they are supported by so many others inspires a grateful humility which is very in line with Stoic thinking. Thank you for bringing Naikan to our attention, Akash. I was unfamiliar with it until now.